Are you still using the keyboard and mouse separately that are connected to two different USB ports and connected via long tangled cables and your workstation looks messy? Well it is the time to be smart and choose wireless keyboard and mouse together. Wireless keyboard and mouse combo price is not so high compared to buying the keyboard and mouse separately. Also you will get rid of the tangled cables which make your workstation messy and your workstation will be cleaner. Before that I would like to share few things to consider before buying wireless keyboard and mouse together. Wireless keyboard and mouse connects your computer via Radio Frequencies, Infrared (IR) or Bluetooth. The first thing to check is the range of the keyboard and mouse. Well the purpose of wireless keyboard and mouse is that you don’t have to sit in front of your monitor all the time. Therefore check the range of the keyboard and mouse i.e. how far they can operate from your workstation. Some wireless keyboard and mouse can even operate through the walls i.e. you don’t have to be in the same room as your workstation in order to operate. 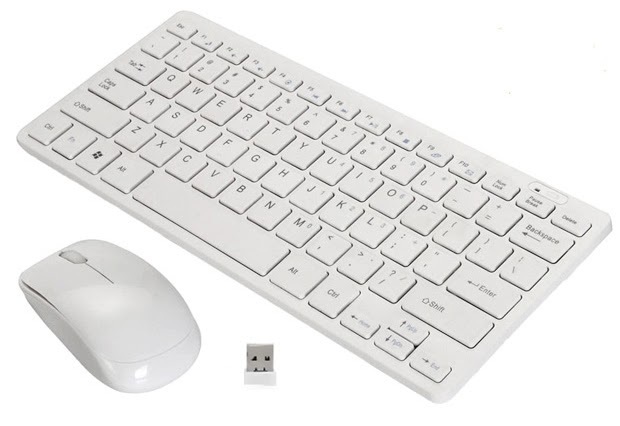 Wireless keyboard and mouse comes with different size as per the user requirement. Keyboard and mouse that are built for heavy duty especially for typing and for gamers generally tall, wide and have few extra buttons that can control volume and other functions. If you have to travel with keyboard and mouse then this may be a little problem. Choose according to your need. You should be comfortable while using the keyboard and mouse. Check for the ergonomically designed keyboard and mouse. More ergonomic designs offer better comfort and safety for long term use. Some manufacturers split the keyboard and angle the two halves upward to provide more natural position for your hands and wrists and the same goes to the design of mouse also. Look for the mouse that fits in your palm it will help to reduce strains. Most wireless keyboard and mouse have AA or AAA batteries. These batteries have a lifetime between six months to over one year after that you have to replace the battery. You might opt for rechargeable battery which you typically need to recharge once a week. However the shortcoming of choosing for rechargeable battery is shorter battery life. By opting for back-lit keyboard and mouse, operating even in the dark will not be an issue. It should be compatibility with all the major operating system i.e. Windows 7,8,10, Mac os etc. These are the basic points you should look before buying Wireless keyboard and mouse. Alternatively if you are a gamer you can look for gaming keyboards. Wireless keyboard and mouse combo uses a single USB port while if you buy wireless mouse and keyboard separately then two USB ports may be occupied therefore opt for the combo. Also the cost of buying the combo will be lesser than buying it separately.